Untamed Sandwiches has been pumping out top-notch, braised meat sandos for Midtown workers and Bryant Park not-workers for a few months now. But up until recently, if you wanted its wares, you had to wait until after you'd already been at work for a few hours... at which point your day was already ruined. Well, no more: Untamed just officially unleashed its breakfast sandwich menu. The rather dainty-named Jacquelyn Park is actually the meatiest of the bunch, with cider-braised pork, cheddar, dilly beans, and black pepper aioli, all topped with sunny side-up eggs. Naturally. Deep breath. 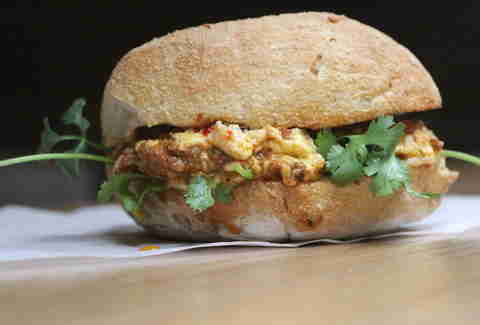 The Ol' Grumpy is a Southern-tinged option with soft scrambled eggs that're mixed with grass-fed beef chili (which has been braised in Sixpoint's The Crisp), and cooked up with black beans and all kinds of chilies, Pimento cheese, hot hot jam, and cilantro. For the veggievores out there, The Giulia's got your back. 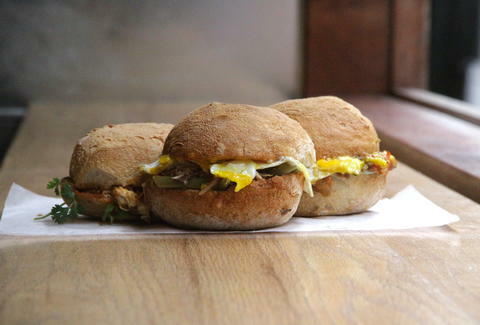 It's a sunny side-up egg with ciambotta-style veggies, olive salad, and basil, all sandwiched between the signature ciabatta breakfast roll... which stands up incredibly well to all the goodness thrown in it. 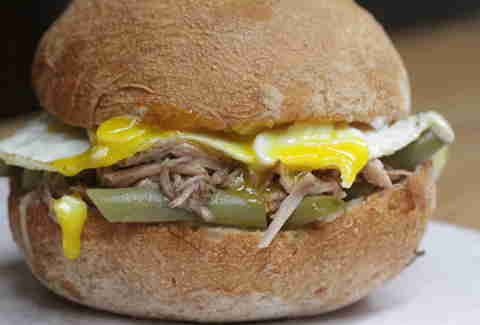 Maybe you're some kind of jerk, or maybe you just aren't in the mood for a breakfast sandwich today. 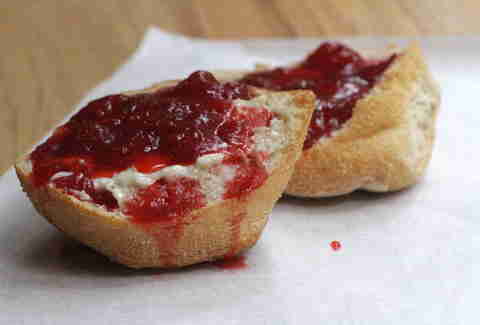 Whatever the reason, if you're not going to get a break'wich, get one of the Toots Toasties, which is crunchy warm bread (its "answer to bagels") topped with either seasonal jam & honey butter (like this one pictured), ricotta & herbs, or pickled veggies & goat cheese. The rest of your day will feel much better. 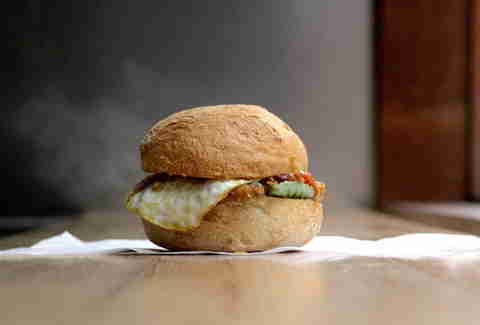 Andrew Zimmer is Thrillist's NYC Editor, and breakfast sandwiches are one of his favorite things in the world. Follow him on Twitter and Instagram.